I’ve been looking at my next project. I have almost finished my Modern Danish ground forces for Cold War Commander and I have another game coming up with them this weekend. I was looking for something naval however as my next project. 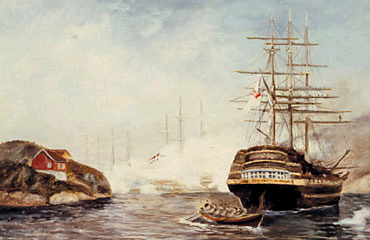 Two things have sprung to mind – Spanish Civil War Naval and Danish Napoleonic Naval. I will admit to having a preference at the moment for the Danish Napoleonic Naval. Well, at least for a starting point. I’ve always loved the Napoleonic (and earlier Anglo-Dutch Wars) ships and the stories set in those times – both the non-fiction (Thomas Cochrane, 10th Earl of Dundonald amongst others) and the fiction (Jack Aubrey and Horatio Hornblower in particular). I have built and painted the 1/1200th vessels produced by both Navwar and Langton but I have found that to do them justice requires a lot of work, especially in regards to the rigging. I may still get around to doing some of them in the future but for now I am looking at 1/2400th. I should note as well that I also looked at Navwar’s 1/3000th sailing vessels but have settled on 1/2400th. Why 1/2400th? I saw a boxed set of Old Glory 1/2400 scale ships and whilst I was interested, the cast on ratlines really made the ships look very bulky. I thought though that the pictures in Mark Latham’s Napoleonic Naval Wargame Rules, Trafalgar, showed some attractive 1/2400th scale models from Hallmark/Figurehead. Now, I have been painting ships from that company’s 1/6000th range recently and I am quite impressed with those models. I thought, therefore, that I would order a sample few which I did. They arrived along with the Japanese cruisers referred elsewhere in Thomo’s Hole. I spent a good hour last weekend looking closely over them. They are really very nice. I then sat for several hours researching both through my books and across the Internet and as a result, I decided to start by building the Danish Fleet from about 1801 first. Later I will build some opponents for it. I did consider other fleets (Swedes and Russians came to mind as well as some Mediterranean types so I could pull in a Xebec or two) but settled on the Danes as a starting point.